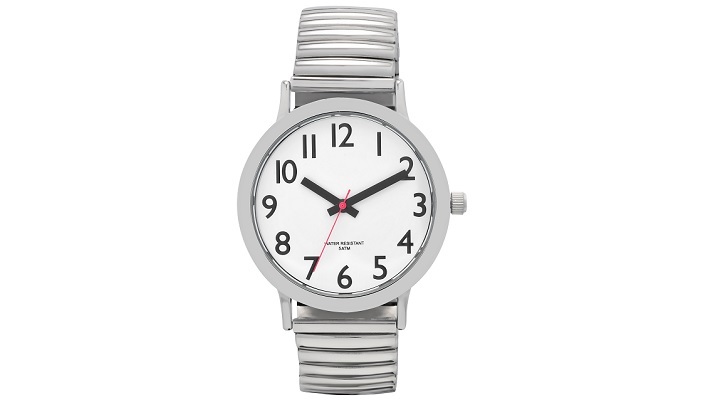 This easy-to-see watch has a clear white face with bold black numbers and black hands. It is fitted with an expanding stainless steel bracelet and is 5 ATM water resistant which means it is suitable for surface swimming. The male version has a case diameter of 40.5mm, whilst the ladies case diameter is slightly smaller at 34mm. The watch is also available with a black crocodile effect strap for mens (product code CW208) and a white crocodile effect strap for ladies (CW209). To find out more or to buy the water resistant watch today, shop online.